This week I’m recommending one of my favorite books that I’ve read this year, a book that completely blew me away. I haven’t read a book this amazing in a long time. I wasn’t sure how I would like this book when I started it. I was sent an unsolicited copy from the publisher and it didn’t really sound like a book I would pick up for myself. But let me tell you, I owe KT Books big time for sending me this book. It’s so outstanding. It blew my mind. I couldn’t put this book down. Allegedly is so incredibly well written and has such diverse and complex characters. I couldn’t relate to Mary but I felt like I could connect to her in a weird way. I’ve never been through any of the things that she has but I felt connected to her. I think it was the fantastic writing that made an unrelatable character seem like she could be the reader’s best friend. This book had me in tears one chapter and screeching at the top of my lungs the next. It was such a roller coaster of emotions the entire book and I loved every second of it. Overall, this book is well worth the read and I highly recommend it. 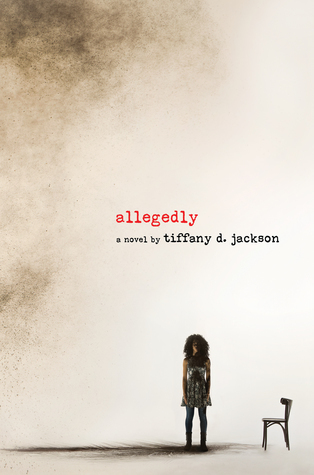 I loved every second of this book and Tiffany D. Jackson has quickly become one of my favorite authors. Everyone seems to be recommending this book.. it seems like I should definitely add it to my tbr.